New Raceroom Series coming July 2! Sim Racing System Sim Racing System News New Raceroom Series coming July 2! We are delighted to announce the new series for Raceroom, starting July 2nd! Jan Seyffarth Official eSports Series. Real drivers have been joining and racing SRS on a regular basis. We are delighted to announce the Jan Seyffarth Official eSports series at SRS! 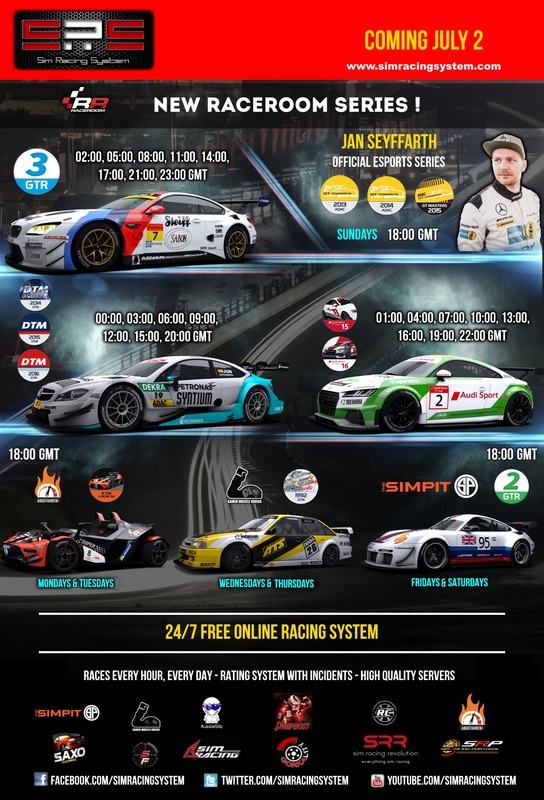 The series will run on sundays, 18:00 GMT with the ADAC GT Masters 2013,2014 & 2015 series. FINALLY YOU FIGURED OUT HOW TO CHOOSE SERIES !!!! NICE !!! Shame there is no WTCC but the TT cup is amazing anyway and slower cars are always fun. But all of the series are amazing so i'm fine with this ! Edit: Even the track selection is good ! I don't think the GTR2 series it really a good idea, the physics on them are kinda trash. I don't know what to replace them with but I say to avoid GTR1, GTR2 and GTRX right now. Right on time too. Will do some summer sale shopping to catch up with the new series. Yep, nice job, GTR3 abd the fact that you included all DTM and TT cars makes it easier to find people who have at least one of the versions of the cars.